Paper Masters is located in rural Hunlock Creek, Pennsylvania and is family owned and operated. Paper Masters was started in 1998 in San Diego, CA in a 1 room office. Recognizing the need for a research and writing company that did only custom written research and reports, the small staff began hiring freelance writers to produce custom research. 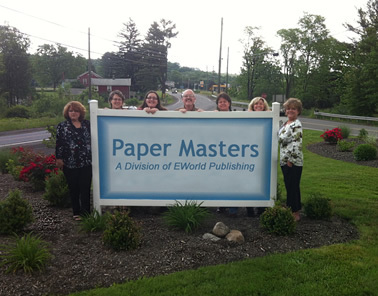 By the year 2000, Paper Masters needed to branch out and was acquired by E World Publishing, Inc. and moved to beautiful Northeastern Pennsylvania. E World Publishing, Inc. also started in 1998 as a small, family operation out of Hunlock Creek, Pennsylvania. E World gave Paper Masters access to qualified, professional freelance writers and a large network of publishing professionals has spurred Paper Masters' growth from a family business to being recognized as the top custom academic research writing company in the world. An Internet business for over 18 years, E World has gained a solid reputation as one of the premier research and writing companies in e-commerce. Ghost writing, web content, business plans, research reports and virtually any type of custom research is available through the over 70 freelance writers we have in many different fields. Today, Paper Masters has 4 satellite locations and a full staff to accommodate the over 15,000 custom research paper orders we receive a year. Under E World's outstanding commitment to academic research, Paper Masters experienced a boom in growth. Paper Masters has many writers in virtually every field of study, a full staff and yet still holds on to its original mission - providing quality, custom research with outstanding attention to customer service. Paper Masters is dedicated to providing outstanding customer service 24 hours a day, 7 days a week. With friendly staff members always available for your questions, you never have to worry if you've made the right choice for your research needs. Paper Masters is located in beautiful Northeastern Pennsylvania, at the base of the Pocono Mountains. In keeping with the community feeling we cherish here, E World reaches out to all our clients and invites them to become part of our Paper Masters community. Located in Northeastern Pennsylvania, E World maintains its commitment to its roots as a family run business while adding daily to its staff of qualified writers. With a commitment to quality, E World challenges anyone to find a more dedicated, customer service oriented Internet based company than what we have built our reputation on.